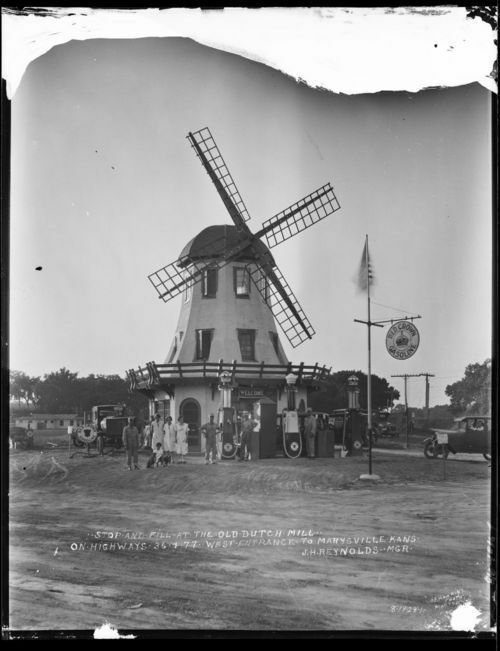 This is a view of the Dutch Mill service station in Marysville, Kansas. The station, which was managed by J. H. Reynolds, sold Red Crown Gasoline and included a lunch counter, six tourist cabins, and a laundry room for use by tourists. It was a part of an early chain of service stations that included locations in Seneca and Salina, Kansas. Also visible in the photograph are men, women, a young girl with three dogs, a couple seated in a parked automobile, a flag pole with an American flag and a Red Crown Gasoline sign, several parked automobiles and trucks, gasoline pumps (all with "crowned" tops), a "Welcome" sign, utility poles and power lines, and tourist cabins and trees in the background. The windmill-shaped service station was located west of the old Blue River bridge on the west side of Marysville, along the roughly one mile stretch where old Kansas highways 36 and 77 merged before going their separate ways. When the new Blue River bridge was built, traffic on highways 36 and 77 was no longer routed past the Dutch Mill, and it went out of business. The Dutch Mill was subsequently dismantled and moved east on highway 36 to Seneca, Kansas.